In this bittersweet and beautifully written memoir, Carolyn See embarks on nothing less than a reevaluation of the American Dream. 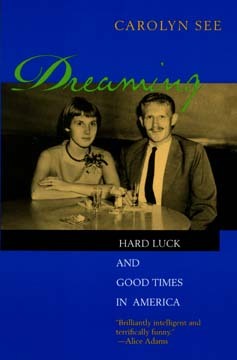 Although it features a clan in which dysfunction was something of a family tradition, Dreaming is no victim's story. With a wry humor and not a trace of self-pity, See writes of fights and breakups and hard times, but also of celebration and optimism in the face of adversity. The story of See's family speaks for the countless people who reached for the shining American vision, found it eluded their grasp, and then tried to make what they had glitter as best they could. Carolyn See is the author of five novels. She has a Ph.D in American literature from the University of California, Los Angeles, where she is an Adjunct Professor of English. Her awards include the Robert Kirsch Body of Work Award (1993) and a Guggenheim Fellowship in fiction.